Select the text box, image, or shape that you want to rotate. For 180-degree flips, select the object and click Format > Flip Horizontally or Format > Flip Vertically. For 90-degree rotate, select the object and click Format > Rotate Clockwise 90° or Format > Rotate Counter-Clockwise 90°. 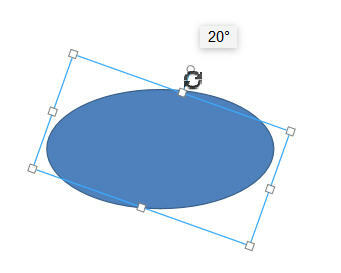 Hover over the small circle near the object's border until a rotation icon is displayed. Drag to rotate the object as much as you want. Press and hold Shift when dragging, the object is rotated to 15 degree angles. Note: You can rotate objects only in uploaded or newly created .pptx files, not in .odp or .ppt files.